Liquor City was established in 1994 and through sheer determination, perseverance and fortitude has grown into one of the largest independently owned liquor groups in the country. Liquor City believe that buying liquor should be a pleasant and convenient experience and that is why they endeavour to make their store environments comfortable and friendly. 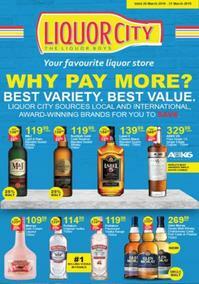 They have well over 150 Liquor City stores nationwide and this liquor giant continues to grow. Beers and ciders: A wide range of premium beers from leading brands are on offer including Castle, Amstel, Hansa, Peroni and many more. Liquor City also stocks a variety of ciders including (among others) the Hunters and Savannah ranges. Wine: Liquor City is a wine lovers dream, whether you are into red or white, rose or bubbly, they will have it all. They also stock a lovely range of ports and after dinner dessert wines. Their extensive range of premium local and international wines will suit every palate and every pocket. Spirits and shooters: Liquor City are proud to showcase an exceptional variety of Vodkas, Cognac, Whiskeys, Gins, Rums and many more quality spirits. They also provide a wide range of shooters for those in the mood for a ‘stiffer’ drink including Lupini, Tequila, Jagermeister, Amarula, Cactus Jack and more. Other: Finally Liquor City also stock a range of non-alcoholic beverages, fizzy drinks and great mixes to make that perfect cocktail on a sunny day! 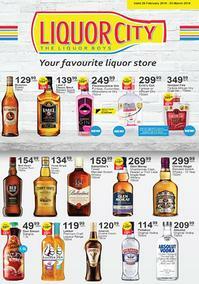 Liquor City offer a wide range of specials and deals on all their alcohol brands and even occasionally have promoters in-store that allow you to taste their premium ranges as you shop for your favourite drinks. 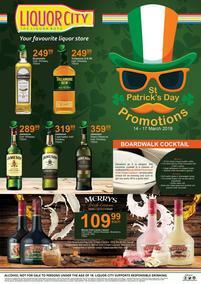 Guzzle endeavours to showcase Liquor City specials as and when they become available, so ensure to bookmark this page to see the latest deals on offer.